Torsion beam rear suspension systems have been widely used in small passenger vehicles. However, welding can lead to local stress concentrations, residual stresses and other various defects, which affects the fatigue life of this system. 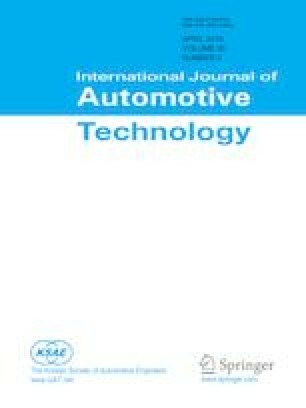 In this paper, 3D digital image correlation (DIC) technique was used to measure the weld region deformation of a torsion beam rear suspension system in the bench test. The test results show that the obvious strain concentration occurred at the welding seam under the cyclic loading. The numerical simulation work by finite element analysis (FEA) has been done to predict the fatigue damage of the torsion beam rear suspension system. The simulation results show that the location of the fatigue crack was at the strain concentration region in the test work. The enhancement test was performed on a proving ground. The fatigure crack location of the torsion beam rear suspension system in the test automobile was coincident with the results by DIC and FEA. If the load conditions of bench tests are close to the road test, DIC is a useful method to predict the fatigue damage by the strain concentration. As a in lab test it would reduce the cost of fatigue analysis.